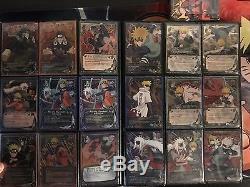 This collection has many rare and sought after Items, this ranges from my Super Rare: Sasuke State 2, Naruto Sage Mode, Itachi Susano'o, Gencon promotional cards and many more. 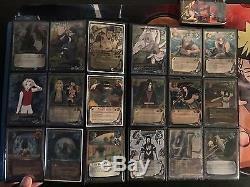 My collection has a total of 165 super rare cards, a lot of Promo cards, a few Rare cards, and a bunch of holo common / rare cards and comes along with my two Monster card binders as well. 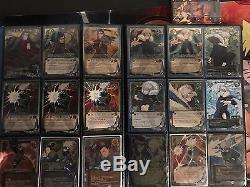 My cards have been taken care of very well and are in near mint condition. 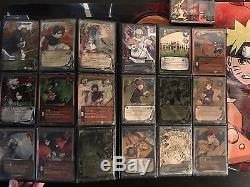 Most are mint, but some may have very minor wear on them, and most of the super rares are sleeved. Most of these cards have been kept in my binder since opening them out of the pack so that's why they're in such good shape. I haven't played with any of these! Sometimes I received them in less than optimal shape. I also have a fully playable starter deck and a complete set of turn markers in case you're interested in playing the TCG. 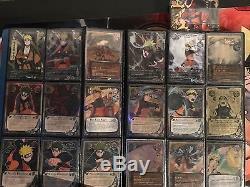 I have a YouTube Channel (Stormninja16) with a video showing off my binders if you're interested in checking out what I have to offer more in depth. This is an excellent collectors item! If you have any questions, feel free to ask! 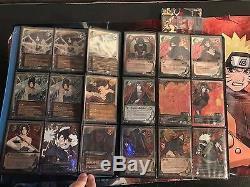 A complete list of all super rare cards included in this collection. Sasuke [Eyes of the Serpent] 1005. Sasuke (State 2) [Power of the Curse] 934. Chidori Stream 575 x 2. Detonating Clay: C4 Karakura 747. Sasuke [For the Aim] 589. Itachi [Despair at the Clan] 259. Susano'o [Impenatrable Defense] 1114. 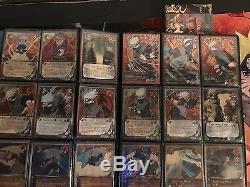 Itachi & Deidara [Experts of Dangerous Justu] 502. Itachi & Kisame [Real Aim] 367. Kakashi (Boyhood) [New Technique] 709. Naruto (Sage Mode) [Ascended] 1395. Wind Style: Rasen Shuriken 907. Naruto (Tailed Beast Mode) [Tailed Beast Form] 522. Naruto (Tailed Beast Mode) [Tailed Beast Form] 591. Naruto [For the Comrade] 588. Wind Style: Rasen Shuriken 645. Naruto [Mastering the Hidden Technique] 524. Naruto [Sage in Training] 919. Naruto (Tailed Beast Form) [Unlimited Energy] B&G 747. Explosion of the Rasengan 382. The 1st Hokage [Supremacy] 1216. The First Hokage [Matchless Hero] 612. The First Hokage [Secret Wood Style Justu] 368. Kakashi [Eye that Detects Falsehood] 377 x3. Earth Style: Rending Piercing Fang 519. Shikamaru & Kakashi [Clever Play] 730. Ninja Art: Shadow Stitching 506. The Second Hokage [Water-Style Justu] 369 x2. The 2nd Hokage [Supremacy] 1251. The Second Hokage [Supremacy] 822. The Second Hokage [Matchless Hero] 613. Kakashi [Detection of the Movement] 473 B&G. Kakashi [The Eye that Sees Through Everything] 526. The 3rd Hokage [Supremacy] 1229. The Third Hokage [For the Greater Good] 968. The Third Hokage [Addressing Past Wrongs] 163. Naruto & Jiraiya [Master and Pupil] 204. Naruto & Yamato [Team Work] 616. Minato [The Yellow Flash] 1122. The Fourth Hokage (Younger Days) [Savior] 702. The Fourth Hokage [Space Ninjustu] 712. The 4th Hokage [Supremacy] 1241. The Fourth Hokage [Lightning Speed] 371. The Fourth Hokage & Gamabunta [The Power That Sealed the Disaster] 391. Kakashi & The 4th Hokage [Seal Specialists] 1060. Tsunade [Tasteless and Ordorless Drug] us059. The Fifth Hokage [Establishment of Medicine] 372 x 2. Temari & Kankuro [Menace of the Sand] 495. Naruto (Tailed Beast Form) [Anger Unleashed] 1184. Itachi (Anbu Days) [Leaf Police Force] 868 x2. Kakuzu [Akatsuki's Soul] 1026. Kakuzu [Threads of Ultimate Power] 989. Pain (Deva Path) [Rigght Ring of Rei] 1152. Pain & Itachi [The Eyes of Pain and Pride]. Kisame [Akatsuki's Blade] 1025. Sasori [Creating the Masterpiece] 878. Zabuza [Demon of the Mist] 1249. Water Style: Five Hungry Sharks 460. Pain (Deva Path) [Deva Path] 1000 x3. Sealing Justu: Breaking the Lion's Roar 562. Itachi [Left Ring of Shu] 1151. Asuma [Fists of Fury] 1042. Shikamaru & Asuma [Shogi Match] us040 B&G. Tsunade & Shizune [Debts] 223. Might Guy [Dynamic Entrance] 640 x2. Gentle Step: Twin Lion Fists 898. Kimimaro (State 2) [Augmentation] 1405. Kabuto [Prominent Medical Skill] 606 x2. Sasuke [Complete Opening of the Eyes] 415. Ultimate Defense: Shield of the Shukaku 248. The 4th Kazekage [Dignity] 691. 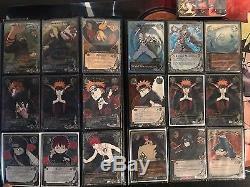 Gaara of the Desert [Conversation] 145 B&G. Gaara of the Desert [Guardian of the Village] 525. Power of State 2 254. 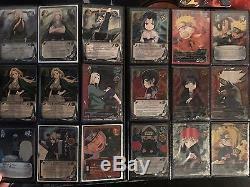 Naruto & Sasuke [Explosion of the Ultimate Justu] us066. Naruto & Shadow Clone [Mastering the Secrets of Rasengan] 406. Naruto & Gamabunta [Reveresed Relationship] 039. Naruto & Jiraiya [Master and Disciple] 816. Naruto 2k Uzumaki Barrage 145. Disaster of the Nine Tailed Fox Spirit 005. Rescue the 5th Kazekage 622. Monzaemon Chikamatsu [Warriors of the White Guard] 1093. Release of Fury 641 B&G. The Eight Inner Gates 087. Mind Transfer, Puppet Curse Justu 972. 8 Trigrams Palms Rotation us064. Demonic Illusion: Toad Confrontation Singing 785. Sakura [Love Conquers Ninjustu] 021 - in bad condition. 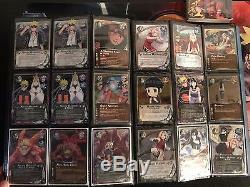 The item "Naruto Card Collection! Stormninja16's from Youtube" is in sale since Monday, July 9, 2018. 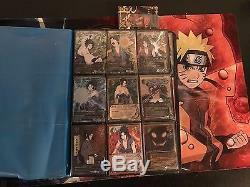 This item is in the category "Toys & Hobbies\Collectible Card Games\CCG Individual Cards".nas" and is located in Chillicothe, Ohio. This item can be shipped to United States.